I’ve successfully converted a Frontier Design Tango audio interface for generating control voltages for analog synthesizers, making it usable with software like Expert Sleeper’s Silent Way and Mark of the Unicorn’s Volta. The performance of the resulting system is far superior to that of my homebrew MIDI-CV converter. I imagine that these older interfaces can be had for cheap, and they can be modified for eight channels of control voltages as described below. I’ve had a Frontier Design Tango A/D/A interface sitting around largely unused since I switched to a MOTU 828mkII and subsequently an Apogee Rosetta 800. 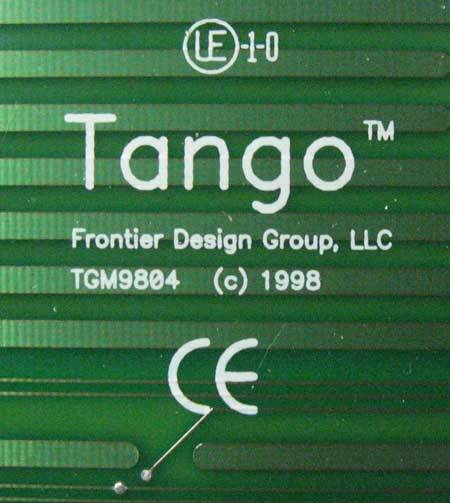 The Tango is the earlier 20-bit model which was superseded by the Tango 24. I suspect the original Tango is worth next to nothing on the second-hand market these days since it has “only” 20 bits of resolution. Right now an eBay search turns up nothing in either current or completed listings. Hence if you can find one you can probably get it for cheap. I’ve been hanging onto mine with the notion that I could use it to patch in more hardware effects if the need arises, but more recently, after the release of Volta by MOTU and Silent Way by Expert Sleepers, I’ve wondered whether I might be able to modify it for DC-coupled output so that I could use it to control my modular synthesizer. After spending a considerable amount of time peering at the PC board traces with a magnifying glass, applying test signals, making measurements at various points, and some amount of trial and error, I successfully converted its outputs from AC-coupled balanced signals to DC-coupled unbalanced signals. After the conversion I am able to use it to control my modular synthesizer’s VCOs over a rather impressive nine-octave range. Here is a description and photographs showing how I did the modifications. The following instructions are provided for entertainment purposes only. Follow them at your own risk. You assume all liabilities for all consequences, direct and indirect, of your decision to attempt this modification. Modifying your Tango as described here could easily destroy it, and will render it unsuitable for audio applications. I have no idea whether modifying the Tango in this manner causes excessive current consumption or other out-of-spec operation that may dramatically shorten its lifespan. I make no guarantees that these instructions apply to any Tango other than my own. If you attempt these modifications and your Tango does not work properly afterwards, I can’t help you fix it. Frontier Design had nothing to do with this modification, is not aware of it, does not endorse it, and won’t be at all sympathetic if you complain to them if something goes awry. No user-serviceable parts inside. Batteries not included. If yours looks different, there may be differences that affect this modification. I have no idea whether or not Frontier Design issued more than one version. Your choice of tools and skills for SMT rework. You’ll need to be able to cleanly remove 16 SMT resistors in 1206 packages. The modification must be performed on each of the eight output channels, and is reversible, so you can try it on one channel and undo it if it doesn’t work to your satisfaction. There are four main steps: removing or bypassing the DC blocking capacitors, adjusting the output gain, disconnecting the negative outputs, and correcting some DC offset. All of the following photographs are hosted on Flickr so you can click them to see larger versions. For control-voltage applications, the DC blocking capacitors are the root of the problem in almost all audio interfaces since they prevent the D/A converters from sending a fixed voltage to the output circuits. It turns out that in the Tango the blocking caps are between the DACs and the anti-aliasing filters. I figured this out after tracking down the data sheet for the DACs. Since the data sheet is for an obsolete part and took a little bit of hunting to find, I’m saving a copy here for future reference. The DC blocking caps are marked in the following photo. They’re identified on the PC board as C37, C45, C46, C54, C55, C63, C64, and C72. Once this step is complete you can verify that the modified output channel can produce a steady DC voltage by using a low-frequency square wave as a test input signal and verifying with an oscilloscope or DMM that the output doesn’t droop. The data sheet for the DAC chip reveals that the DAC’s output has a positive bias voltage of 2.3V. (This is partly why the DC blocking caps are there.) Unfortunately for us, that bias voltage is high enough that when the output of the DAC is amplified by the Tango’s output buffers, the maximum output is clipped about halfway through its useful range by the operating range of the op-amps in the buffers. If you set the output-level jumper blocks in the Tango to the -10 position, the output won’t be clipped, but the resulting voltage range isn’t large enough to be of much use to a synthesizer module. Hence we need to adjust the gain of the circuits somewhere between the DAC and the output jack so that it’s as large as we can make it without it being clipped by the op-amps. Fortunately I figured out a simple way to adjust the gain. If you look closely at the headers for the +4/-10 output-level jumpers, you’ll see a 4k32 SMT resistor right next to the headers. That resistor is simply shorted if you put the jumper in the +4 position. In other words, the output level of the channel is determined by the presence or absence of that resistor in the circuit. So if we change that resistor, we change the output level. We know that a 4k32 resistor produces a level that’s too low, and a short circuit produces a level that’s too high, so (like Goldilocks) we need something in between. We can make the resistance smaller by putting another resistor in parallel with the 4k32 resistor. Conveniently, we can put a resistor in parallel simply by attaching it to the middle and front [“front” meaning nearer the front of the case] pins of the header. It would have been far simpler and faster to add SMT resistors on top of the existing resistors, but I didn’t have any SMT resistors of the appropriate value on hand. The Tango has balanced outputs but we only need the positive signal for generating control voltages. (The Expert Sleepers site mentions that you can use the negative signals from balanced outputs for inverted voltages, which is a good idea, but sadly I wasn’t able to figure out how to make my modifications work for both the positive and negative signals. I could probably do so with some more experimentation, but I’ve already spent long enough on this project for now.) Furthermore, since plugging an unbalanced TS plug into the Tango’s output shorts the negative output to ground, we probably want to disconnect the negative output altogether. If we leave it connected, we’re potentially putting a DC voltage of up to 13V across the 150R output resistor and there’s really no need to draw that much current if we’re not doing something with it. They’re easy to spot because the rest of the resistors in that area are all 10K. Grab your hot tweezers, or whatever you use for SMT rework, and take ’em out. Make sure there isn’t any residual solder shorting the pads. (Hopefully you didn’t need to be told that.) Keep your tweezers handy because you’re going to remove another eight resistors in the next step. Remember that DC offset present in the DAC’s output that I mentioned earlier? It’s still there, of course. Changing the gain allowed the output buffers to create an unclipped signal, but we’d still like a bipolar output that’s symmetric around 0V. Right now we have a positive-only output. After a good deal of head-scratching and poking around I figured out how to apply a negative offset voltage to produce a bipolar output. I did this by pre-bending the leads of the resistor, cutting them to about 1.5cm, and bending the end of one lead to a 90-degree angle. Then I’d push the straight lead down on the via while heating it and the solder in the via with my soldering iron until the solder melted and the lead slid a little ways into the via. Then I soldered down the other lead on the PCB pad, and finally added a little more solder to the via connection. This part of the modification isn’t quite perfect: an offset of about +0.12V still exists at the outputs. In most cases that isn’t enough of an offset to be problematic; the only instance in which I can think that it might be a problem is if you use the Tango’s output to control VCAs, in which case the +0.12V might be enough to cause an audible leak. You can probably correct this offset in Silent Way or Volta in that case. If you apply a full-scale, bipolar input signal to the Tango, you should see a bipolar output of about 9.5V p-p. Hook it up to your CV input of choice, get yourself a copy of Silent Way or Volta (or create your own means of generating control signals, maybe by using something like Reaktor or Pd), and have a blast. If you have any questions or comments, leave them below. I can’t promise that I can answer all of your questions but I’ll try. I’d love to hear from you if you are able to modify your Tango by following these instructions. Here’s a demo of my modified Tango in action, driven by Silent Way. Use the “480p” resolution option if you have the bandwidth; the audio is less munged by YouTube’s compressor. totally genius…If I understand correctly this might be a way for MS-20 freaks to gain midi control of their synths by just leaving out the step of creating positive and negative voltages, since the MS-20 uses control voltages of 0-10v (not supported by motus)…awesome! You mention picking up a Tango 20-bit for next to nothing. I actually have a Tango 20-bit that I’d like to sell, for whatever I can get. (Otherwise, it’s just going to sit here and take up space). Has anyone approached you about needing one to do the mods you suggest? If so, I’d be happy to let my old Tango go to a good home. Thanks for writing, but nobody has contacted me about looking for a Tango. I’m thinking about reversing the modification on mine because I’ll soon be obtaining an Expert Sleepers module that does the same ADAT->CV conversion. If I botch that reversal, maybe I can give your Tango a new home.